Proven performance for a range of animal applications including genotyping, sequencing, parentage, DNA diagnostics & bio-banking. Ideal for use with livestock (bovine, ovine, caprine), companion animals (canine, feline, equine) and other species by researchers, breeders, laboratories and consumers. 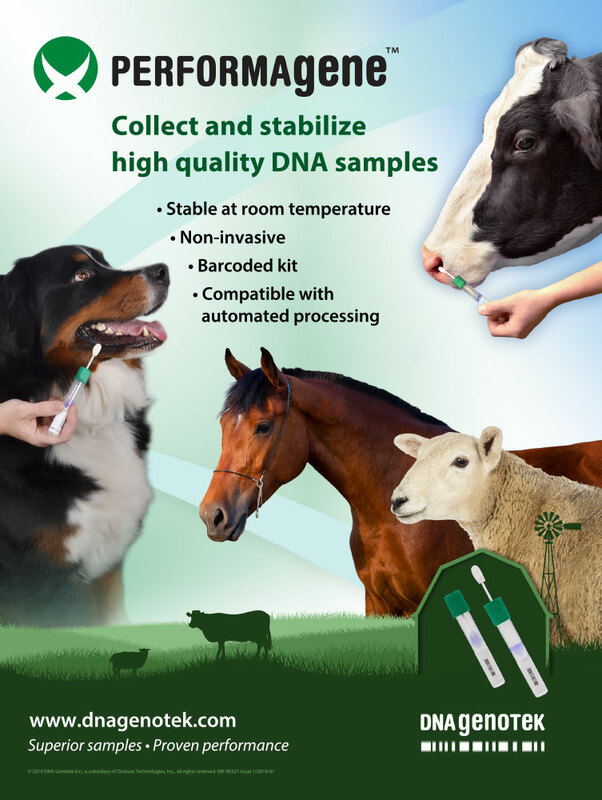 Proven performance with livestock and companion animals for parentage, breed identity, inherited disease testing, genotyping, sequencing and sufficient sample to bio-bank. Validated for multiple PCR assays and on Illumina, Affymetrics, Fluidigm platforms. Reliable across all collection environments – barn, field, clinic or home. Samples can be shipped without the need for cold chain transport using the standard postal system making them ideal for mailing studies. Maximize animal DNA recovery for your genetic applications. The critical step in any animal genetic application is the extraction of DNA from collected samples. Maximize the recovery of DNA from your PERFORMAgene samples with the PG-AC extraction kit. Performagne samples can be banked for 1 year at room temperature or frozen for longer term storage. These samples can withstand multiple freeze thaw cycles. There are two reagent packages optimized for PERFORMAgene. Please refer to the Troubleshooting Guide if you have questions regarding your sample preparation. DNA Genotek facilitates the linkage between Genomic Service Labs and Researchers and Breeders. Each partner lab within the program has demonstrated expertise in working with our products. This approach ensures that our partners can make the best use of animal DNA PERFORMAgene samples and deliver optimal results to our mutual customers. Would you like to become a PERFORMAgene partner? Click here for more information. 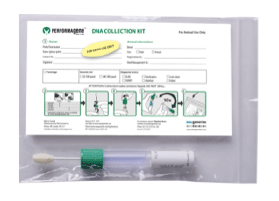 The PERFORMAgene animal DNA collection kit has proven performance for many applications on multiple downstream assays. Find a PERFORMAgene Partner Lab to process your samples. For large quantity purchases bulk packaging is an option. 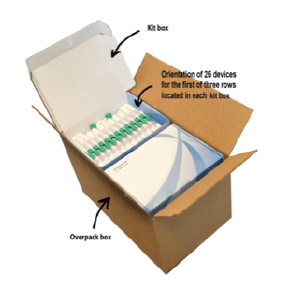 Each overpack box contains 10 kit boxes which contains 78 devices (three rows of 26 devices). 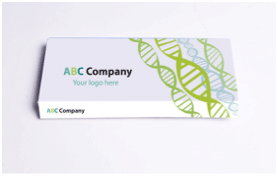 For commercial applications that require delivery of the collection kit and return of the DNA sample with the animal identified. The label can be branded with up to four colour graphics and contain custom information fields. 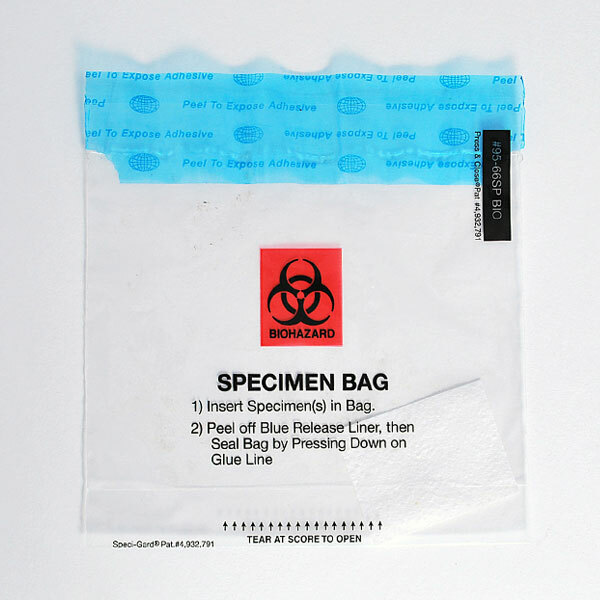 The custom polybag contains an absorbent material sufficient to soak up at least 4 mL of liquid. 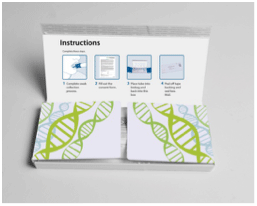 Click here to view a guideline for shipping samples collected with the PERFORMAgene collection kit. 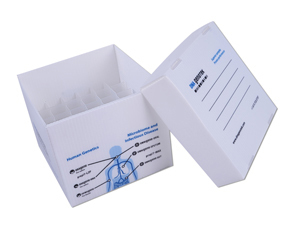 DNA Genotek’s sample storage boxes are designed to provide convenient sample storage. Supplied at-packed prior to use, the storage boxes save valuable laboratory shelf-space and eliminate the hassle of stacking. 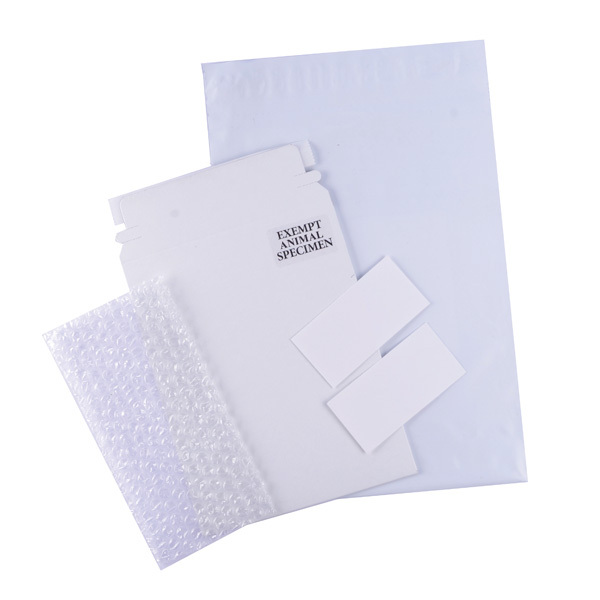 Made of a durable moisture resistant material, they outlast cardboard alternatives making them ideal for re-use. Each storage box holds 36 Oragene®, ORAcollect®, OMNIgene® or PERFORMAgene™ collection tubes. 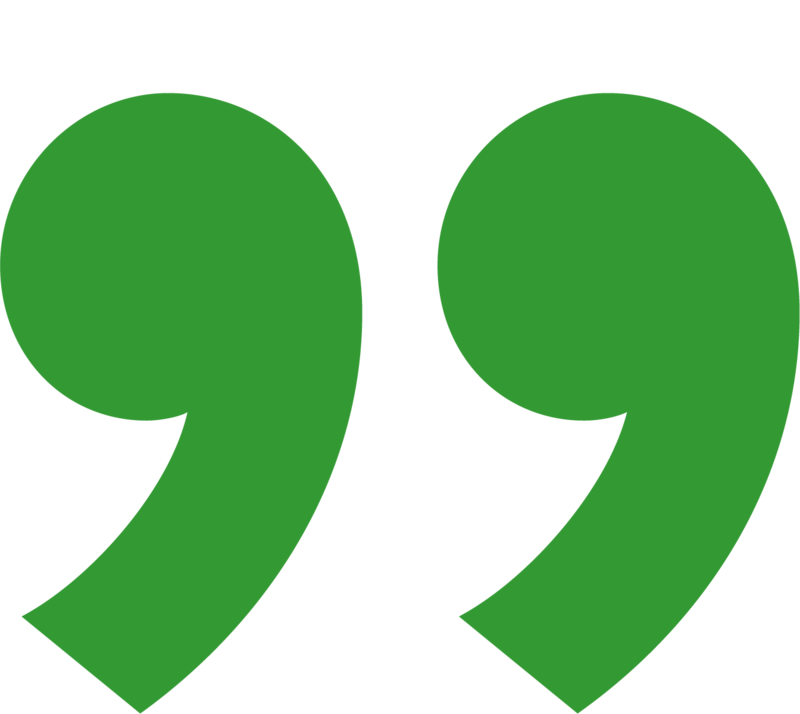 What publications are available for PERFORMAgene? PERFORMAgene has been used in many studies, a list of publications are available on our website. What Service Provider labs are available to process PERFORMAgene samples? What animals can these kits be used for? PERFORMAgene has been proven to work for companion animals, livestock animals and many other animal species. PERFORMAgene has been validated on numerous breeds of cattle, dogs, sheep, goats, horses as well as other animals. How long is the DNA stable for? Once collected, the DNA is stable in PERFORMAgene kits at room temperature for 1 year. 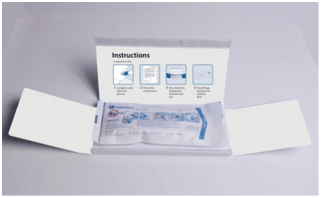 What is the shelf life of PERFORMAgene kits? 2 years prior to use. The expiration date of each kit is printed on the label found on the side of the collection tube. How can I link the DNA sample to the livestock's ear tag or companion animal’s micro chip? 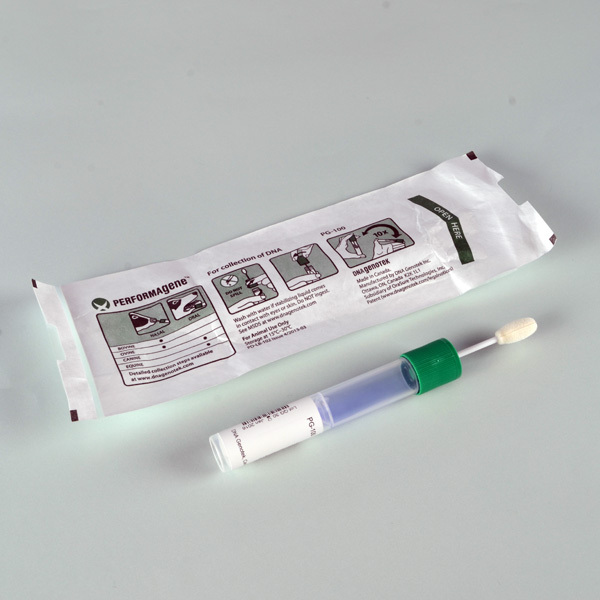 All PERFORMAgene tubes have a unique standard barcode located in two orientations on the sample. This barcode can be scanned and linked to the animal's ear tag or microchip prior to collection. Alternately, the sample tube includes a large writing space to easily include the animal’s identification. How easy is the sample collection? Extremely easy a typical collection takes 10-30 seconds and can be done on restrained or unrestrained animals. What is the DNA yield using PERFORMAgene with cattle? From a study of 225 unrestrained cattle, the average amount of DNA collected with one nasal swab was 24.2µg. Is there a difference in DNA yield between calves and adult cattle? Calves tend to result in higher DNA yields due to the increased number of cells in the nasal sample. How much bacterial DNA is in the PERFORMAgene samples? Using a real-time PCR assay with bacterial 16S rRNA primers, the average amount of bacterial DNA was 3.3%, with a range from 0.4 to 14.2%. What temperature should I store the PERFORMAgene sample at? PERFORMAgene stabilizes the DNA over a range of temperatures. 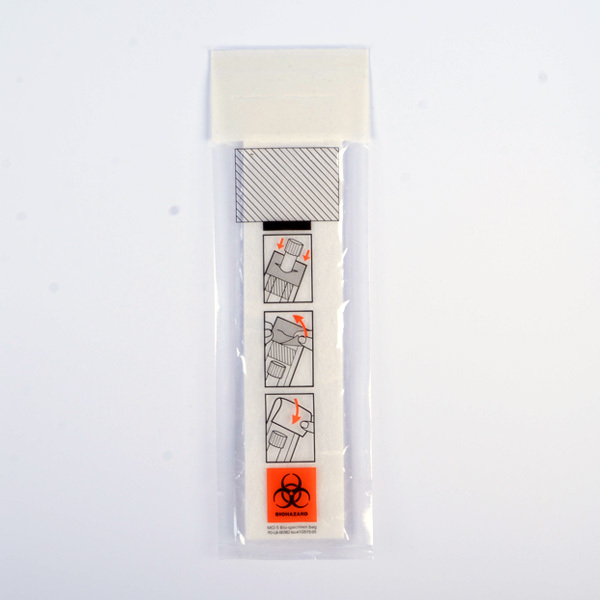 DNA samples may be stored at room temperature or frozen at temperatures such as -20°C or -80°C. Please note that storage at 4°C is not recommended for PERFORMAgene samples. Samples can go through multiple freeze/thaw cycles. How do I transport PERFORMAgene samples through the post? Samples collected in PERFORMAgene are considered "Exempt Animal Specimens" and are easily shipped within countries and across-borders. What options do I have for purifying PERFORMAgene samples? 0.5ml Purification protocol (PG-AC1/4) – recommended for full purification of samples for downstream applications requiring very high quality DNA such as micro arrays and sequencing. Can samples stored in PERFORMAgene be purified using automated extraction robots? Yes. PERFORMAgene is designed to integrate directly into liquid handling robots without the need to prepare the samples in any way. What is the best way to quantify PERFORMAgene DNA yield? For both Purification methods, we recommend quantifying your DNA with a fluorescent dye such as SYBR Green or PicoGreen (Molecular Probes). 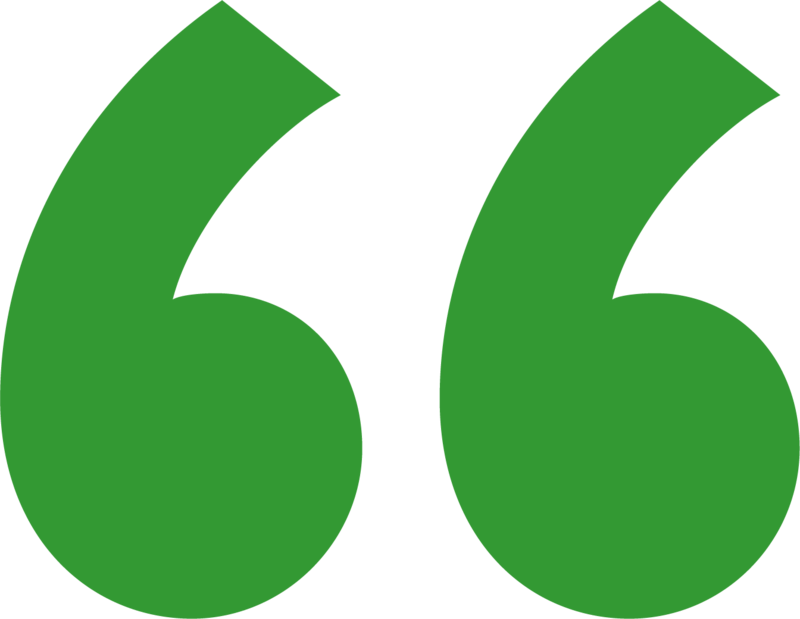 Quantification by absorbance cannot be used with the 50ul protocol as the reagents used will interfere with the absorbance reading. What genetic applications can PERFORMAgene be used for? What downstream assays can I use animal DNA collected in PERFORMAgene for? DNA Genotek and valued customers have validated PERFORMAgene on a wide range of downstream assays, including SNP Genotyping, microarray and microsattelites, sequencing. PERFORMAgene kits have greatly benefited our project. To be able to get high quality and quantity bankhar DNA through such a quick and easy process, even while wearing thick gloves in the Mongolian winter, is truly remarkable.